Today's VIS image shows part of the inner rim of Kaiser Crater. 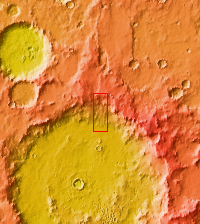 The rim has been dissected by numerous gullies. Kaiser Crater is located in Noachis Terra.